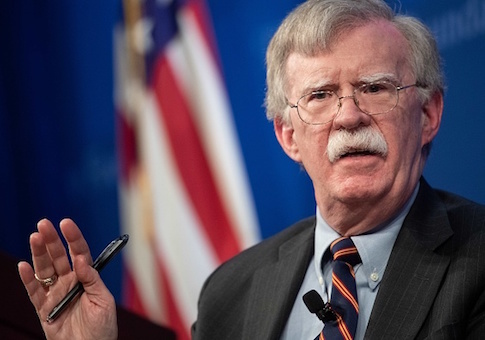 In a statement Friday, National Security Adviser John Bolton condemned the Russian military presence in Venezuela, calling it "a direct threat to international peace and security in the region." Bolton warned that the Russian buildup constituted "provocative actions." Referencing the Monroe Doctrine, Bolton urged non-regional actors to steer clear of the South American conflict. "We strongly caution actors external to the Western Hemisphere against deploying military assets to Venezuela, or elsewhere in the Hemisphere," he said. Russian vessels, including submarines, transported forces to Venezuela's shores over the weekend. According to Reuters, two military planes arrived near the Venezuelan capital Saturday "carrying nearly 100 Russian troops, according to local media reports." A U.S. spokesman called the move a "reckless escalation." Russia denied the charges, though it admitted the presence of troops. A spokesman said Tuesday that "Russian specialists" operating in the Latin American nation were lawfully present vis-a-vis a "military-technical cooperation agreement." Venezuelan president Nicolas Maduro succeeded Hugo Chavez in 2013, continuing his socialist administration but lacking his widespread popularity. Under Maduro, Venezuela's once thriving economy has fallen into shambles. Hyperinflation, food shortages, and rampant misadministration have escalated into a brutal crackdown on those seeking reprieve. In January, President Donald Trump recognized Juan Guaido the lawful leader of Venezuela, defying Maduro's sham reelection. Most western nations have followed the president's lead. China, Russia, and Cuba remain behind Maduro. Maduro has taken increasingly drastic measures to secure his post in Caracas. On Thursday, he declared Guaido would be barred from public office for fifteen years. Guaido rejected the proclamation. Maduro has also welcomed friendly foreign intervention in addition to Russian forces. The U.S. has long alleged that Cuba was propping up his regime. Earlier this month, Secretary of State Mike Pompeo charged Cuba with drawing out the Venezuelan people's suffering. "When there is no electricity, thank the marvels of modern Cuban-led engineering," Pompeo said. "No nation has done more to sustain the death and daily misery of ordinary Venezuelans," he said, "than the communists in Havana." "When there's no water, thank the excellent hydrologists from Cuba," he said. "When there's no food, thank the Cuban communist overlords." Cuba has provided security for Maduro and embedded its own forces in the Venezuelan secret police "in a clear violation of Venezuelan sovereignty," according to Pompeo. On Wednesday, Trump met with Fabiana Rosales de Guaido, wife of the U.S.-backed head of state. During that meeting, the president reaffirmed that continued Maduro rule was unacceptable. "These are things that should never have been allowed to happen," he said. "But I’ll fix it." Asked about foreign interference, Trump insisted that "Russia has to get out." Since President James Monroe's administration, the United States has long held that the Western Hemisphere is of special strategic interest, and that military action by external powers will meet resistance. (Obama-era Secretary of State John Kerry did declare that "the era of the Monroe Doctrine is over.") The Trump administration has strongly signaled its support for the longstanding policy. "We will continue to defend and protect the interests of the United States, and those of our partners in the Western Hemisphere," Bolton said. Those mutual interests he argued, "are rooted in a shared respect for liberty, security, and the rule of law." Special Envoy to Venezuela Elliott Abrams said the same this week, insisting on the resolve of the Trump White House. "My advice to people in Venezuela who think that ‘all options' is kind of a joke or symbolic or doesn't mean anything, don't test the president," he told the BBC. This entry was posted in National Security and tagged Donald Trump, John Bolton, Nicolas Maduro, Venezuela. Bookmark the permalink.